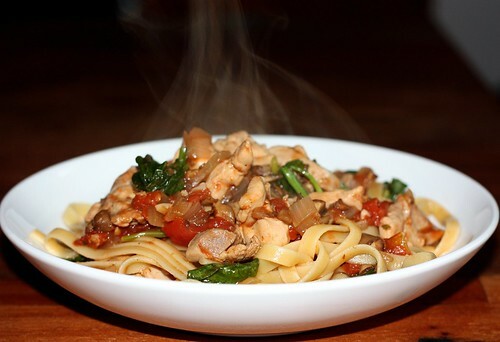 Chicken and Mushroom Ragù – Elly Says Opa! I’ve had this saved from Erin’s blog for quite some time, and I’m so glad I finally got around to making it. As you can probably tell, I didn’t use pappardelle. Neither the grocery store nor the specialty/ethnic store had any. Same goes with arugula (I used spinach instead). What gives? I don’t tpically have problems finding either of those ingredients. At any rate, this is such a delicious pasta dish. The balsamic vinegar adds just a touch of sweetness without overpowering the dish at all, and all the flavor of the rosemary is subtle and makes this even more earthy. Of course, you know how much I adore the chicken thigh. I really wish more people did, too. Embrace the chicken thigh, all you white meat people! It’s so tender and much more flavorful, especially in dishes like this. I’ll definitely be making this again – it’s so easy and delicious! Finely chop the mushrooms and mince the garlic, or put together into a food processor and pulse until combined. Heat the oil in a saute pan/skillet over medium-high heat until shimmery. Season chicken with salt and pepper and add to the hot oil. Cook until just golden, about 3 minutes, and remove from pan with a slotted spoon. Reduce heat to medium and cook the onion, about 3 minutes. Add mushroom and garlic mixture, rosemary, and salt and pepper. Stir constantly until beginning to brown, about 4 minutes. Add vinegar and cook until evaporated. Add chicken and tomatoes (with juice) and simmer, breaking up tomatoes with a spoon and stirring occasionally, until thick – about 15 minutes. Meanwhile, cook the pasta in salted boiling water until al dente. Add arugula to the sauce and stir until just wilted. Add the drained pasta and cook for 1 minute.